Prior to a Sunday afternoon win over the visiting New Orleans Hornets, the New York Knicks were in the midst of a bad stretch, having lost three straight games, four of their last six and six of their last nine since Christmas Day. With the Knicks struggling and looking less like a potential championship-contending unit than a banged-up, gassed and frazzled collection of individuals, league observers have been keeping a close eye on the Knicks, and especially star forward Carmelo Anthony — and one observer, in particular, sounds like he's keeping a closer eye than most. The purpose of this command was unclear, but Dolan must have had a good reason to eavesdrop on Melo’s interactions. Was it to luxuriate in the poetic musings of his most valuable player, even though he is far from his most voluble player? 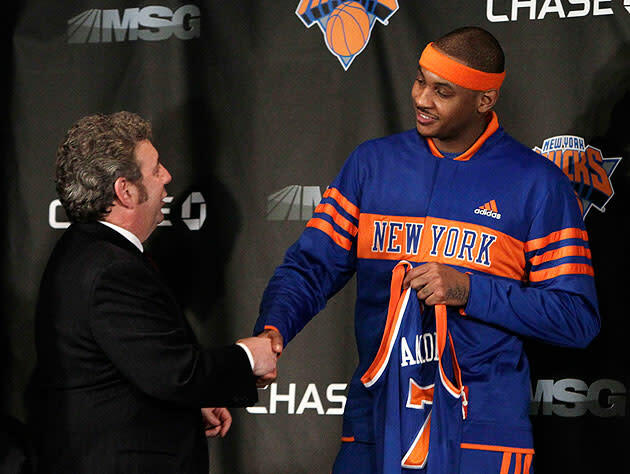 Was it a teaching tool, so his coaches could school Melo on the potential hazards of courtside misconduct? The "surreptitious" taping — which makes this sound like something out of "All the President's Men," which would seem pretty far-fetched if not for the fact that the Knicks have been besieged by seemingly endless in-house drama and conflict for most of the past 13 years or so — allegedly came four days after Anthony engaged in some serious on-court trash talk with Kevin Garnett during the fourth quarter of a heated game between the Knicks and Boston Celtics. A clearly furious Anthony tried to take over the game and failed, shooting just 2 for 10 down the stretch and helping the Celtics capture a 102-96 road win over their Atlantic Division rivals. Anthony, still incensed after the final buzzer, waited outside the Celtics' team bus to confront Garnett after the game; that confrontation didn't amount to much in the moment, but it did lead to a one-game suspension for the Knicks' top scorer, sidelining him for a Thursday night contest against the Indiana Pacers that New York lost due largely to a dreadful inability to score the basketball. 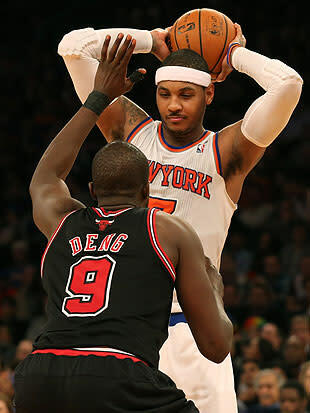 Add on the Friday night loss to Chicago in which the Knicks never led and trailed by 22 entering the fourth quarter, thanks in part to Anthony getting off an ice-cold start while Bulls counterpart Luol Deng filled it up early, and you've got a pretty rough patch, Melo-wise. This doesn't seem likely to help matters much. The initial reaction to D'Alessandro's report from most corners — well, beyond just "secretly taping your star player, or anybody, for that matter, is super creepy" — has been to note that this won't exactly do wonders for Melo's reputation, which was shaken a bit when Garnett's tactics made it blatantly obvious that, MVP-caliber early-season performance aside, you can rattle Anthony and get him off his game. As Tom Ley wrote at Deadspin, the prospect of Dolan calling for this as a means of keeping a closer eye on his star makes Melo look like "a hothead who needs to be under the constant, direct supervision of his employer," while the (more unlikely) prospect of it being done with Anthony's knowledge makes him seem like "an oversensitive baby who needs to tattle about all of the mean things that get said to him." And if, as D'Alessandro posits, the intended endgame is to point out to the NBA's disciplinary czars just how nasty opponents are being to Anthony, that seems like an approach unlikely to bear any fruit; it's not like refs are suddenly going to start legislating verbal taunts differently just to spare the Knicks' main star. So, as has often tended to be the case with Dolan's decisions, we're left wondering what the point of the alleged action is, and how he thought it might be helpful. How did the NBA know Anthony “attempted to engage” Garnett after the game? The first piece of evidence was provided by the camera of Comcast SportsNet New England, covering the Celtics. The camera was near a ramp in the bowels of the Garden, where Boston’s bus was parked. The video showed Anthony lingering, waiting to confront Garnett. On Wednesday, Time Warner-owned TMZ aired video, shot by an operative in the same area, of Anthony following after Garnett and the two exchanging words, which were barely audible. While the video was not exactly HD-quality, it painted an ugly picture of life outside the NBA bus, one that must have been cringe-inducing to David Stern. Dolan, too. His skin was crawling for a different reason. These outlets came strolling into his house, the refurbished Garden, and had cameras in the right place at exactly the right time, providing enough video to thoroughly embarrass his organization and get Anthony suspended. It’s one thing to be busted, but when it’s done by the competition — ouch. So, the theory would go, after watching two competitors use their recording equipment to nail Anthony and the Knicks, maybe Dolan decided to use his in an effort to protect his player and team should some controversy emerge — which wasn't exactly out of the question, considering the last time Chicago and New York played at the Garden, Anthony was ejected (as was coach Mike Woodson, center Tyson Chandler and the Bulls' Noah) from a heated, physical, foul-and-trash-talk filled game. It seems weird and kind of nonsensical, but so does most of the rest of what's been raised in this situation; maybe it makes as much sense as anything else. Anthony scored 27 points — albeit on 25 field-goal attempts, in continuation of a trend that's seen Anthony's shot-jacking rise and scoring efficiency slide a bit of late — and grabbed seven rebounds in the Sunday matinee win over the Hornets to help get New York back on the winning track before a trip across the pond to London, where the Knicks will play the Detroit Pistons on Thursday in the third regular-season NBA game ever to be played in Europe. I'm not entirely sure how the U.K.'s statute governing the acceptable use of surveillance technology differs from our own, but just in case, Jimmy D. might want to cool it on the sneak-tip recording on Thursday; we wouldn't want an international incident on our hands, now would we?